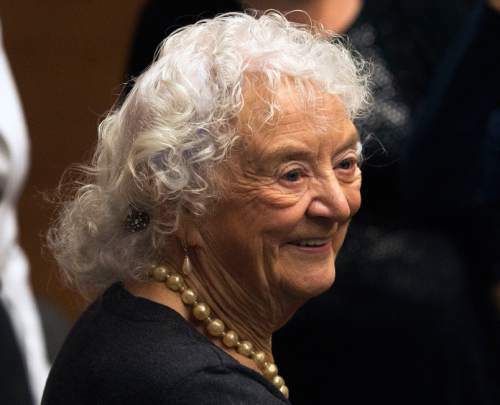 Steve Griffin | The Salt Lake Tribune Dignitaries from Salt Lake City to Spain were on hand Friday as Utah artist and sculptor Pilar Pobil received the Cruz de Oficial de la Real Orden de Isabel la Catolica award in a ceremony at the University of Utah Tanner Humanities Center. The award, presented by the Ministry of Foreign Affairs of Spain, was started by Queen Isabel in the 1700s to honor those born in Spain who have expanded the arts and culture of the country, although they may live elsewhere. Pobil, born in Madrid in 1929, is best known for her brilliantly colored watercolors and oils that have been exhibited throughout Utah and in Spain and Mexico. 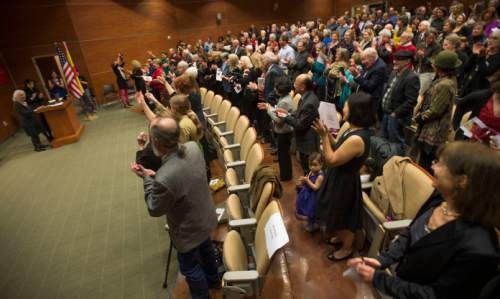 The event was held at the Tanner Humanities Center in Salt Lake City, Friday, February 19, 2016. Steve Griffin | The Salt Lake Tribune Dignitaries from Salt Lake City to Spain were on hand Friday as Utah artist and sculptor Pilar Pobil received the Cruz de Oficial de la Real Orden de Isabel la Catolica award in a ceremony at the University of Utah Tanner Humanities Center. The award, presented by the Ministry of Foreign Affairs of Spain, was started by Queen Isabel in the 1700s to honor those born in Spain who have expanded the arts and culture of the country, although they may live elsewhere. Pobil, born in Madrid in 1929, is best known for her brilliantly colored watercolors and oils that have been exhibited throughout Utah and in Spain and Mexico. The event was held at the Tanner Humanities Center in Salt Lake City, Friday, February 19, 2016. 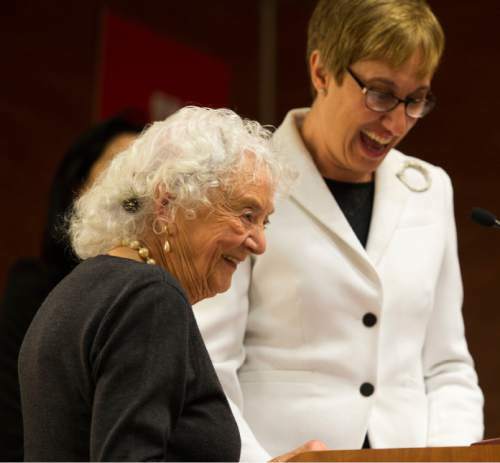 Steve Griffin | The Salt Lake Tribune Dignitaries from Salt Lake City to Spain were on hand Friday as Utah artist and sculptor Pilar Pobil received the Cruz de Oficial de la Real Orden de Isabel la Catolica award in a ceremony at the University of Utah Tanner Humanities Center. The award, presented by the Ministry of Foreign Affairs of Spain, was started by Queen Isabel in the 1700s to honor those born in Spain who have expanded the arts and culture of the country, although they may live elsewhere. Pobil, born in Madrid in 1929, is best known for her brilliantly colored watercolors and oils that have been exhibited throughout Utah and in Spain and Mexico. The event was held at the Tanner Humanities Center in Salt Lake City, Friday, February 19, 2016. Steve Griffin | The Salt Lake Tribune Dignitaries from Salt Lake City to Spain were on hand Friday as Utah artist and sculptor Pilar Pobil received the Cruz de Oficial de la Real Orden de Isabel la Catolica award in a ceremony at the University of Utah Tanner Humanities Center. The award, presented by the Ministry of Foreign Affairs of Spain, was started by Queen Isabel in the 1700s to honor those born in Spain who have expanded the arts and culture of the country, although they may live elsewhere. Pobil, born in Madrid in 1929, is best known for her brilliantly colored watercolors and oils that have been exhibited throughout Utah and in Spain and Mexico. The event was held at the Tanner Humanities Center in Salt Lake City, Friday, February 19, 2016. 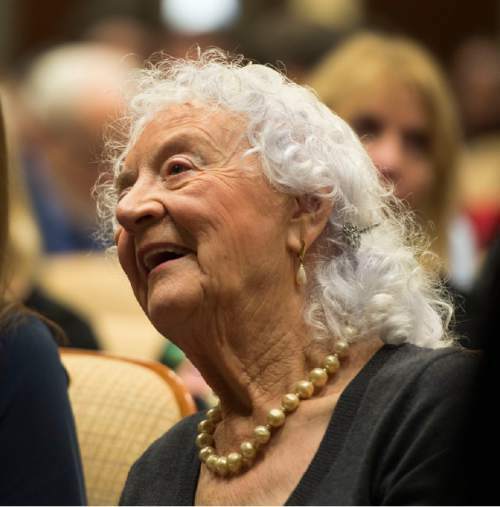 Steve Griffin | The Salt Lake Tribune Dignitaries from Salt Lake City to Spain were on hand Friday as Utah artist and sculptor Pilar Pobil received the Cruz de Oficial de la Real Orden de Isabel la Catolica award in a ceremony at the University of Utah Tanner Humanities Center. The award, presented by the Ministry of Foreign Affairs of Spain, was started by Queen Isabel in the 1700s to honor those born in Spain who have expanded the arts and culture of the country, although they may live elsewhere. Pobil, born in Madrid in 1929, is best known for her brilliantly colored watercolors and oils that have been exhibited throughout Utah and in Spain and Mexico. The event was held at the Tanner Humanities Center in Salt Lake City. 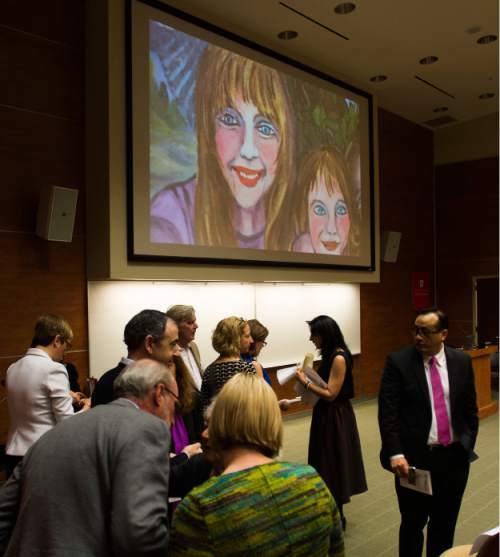 Steve Griffin | The Salt Lake Tribune Dignitaries from Salt Lake City to Spain were on hand Friday as Utah artist and sculptor Pilar Pobil received the Cruz de Oficial de la Real Orden de Isabel la Catolica award in a ceremony at the University of Utah Tanner Humanities Center. The award, presented by the Ministry of Foreign Affairs of Spain, was started by Queen Isabel in the 1700s to honor those born in Spain who have expanded the arts and culture of the country, although they may live elsewhere. Pobil, born in Madrid in 1929, is best known for her brilliantly colored watercolors and oils that have been exhibited throughout Utah and in Spain and Mexico. The event was held at the Tanner Humanities Center in Salt Lake City, Friday, February 19, 2016. Steve Griffin | The Salt Lake Tribune Dignitaries from Salt Lake City to Spain were on hand Friday as Utah artist and sculptor Pilar Pobil received the Cruz de Oficial de la Real Orden de Isabel la Catolica award in a ceremony at the University of Utah Tanner Humanities Center. The award, presented by the Ministry of Foreign Affairs of Spain, was started by Queen Isabel in the 1700s to honor those born in Spain who have expanded the arts and culture of the country, although they may live elsewhere. Pobil, born in Madrid in 1929, is best known for her brilliantly colored watercolors and oils that have been exhibited throughout Utah and in Spain and Mexico. The event was held at the Tanner Humanities Center in Salt Lake City, Friday, February 19, 2016. Steve Griffin | The Salt Lake Tribune Dignitaries from Salt Lake City to Spain were on hand Friday as Utah artist and sculptor Pilar Pobil received the Cruz de Oficial de la Real Orden de Isabel la Catolica award in a ceremony at the University of Utah Tanner Humanities Center. The award, presented by the Ministry of Foreign Affairs of Spain, was started by Queen Isabel in the 1700s to honor those born in Spain who have expanded the arts and culture of the country, although they may live elsewhere. Pobil, born in Madrid in 1929, is best known for her brilliantly colored watercolors and oils that have been exhibited throughout Utah and in Spain and Mexico. 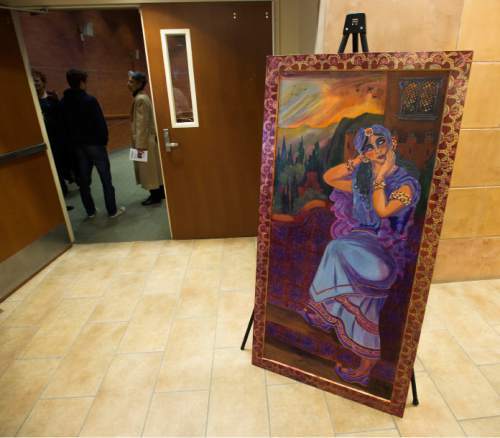 The event was held at the Tanner Humanities Center in Salt Lake City, Friday, February 19, 2016. 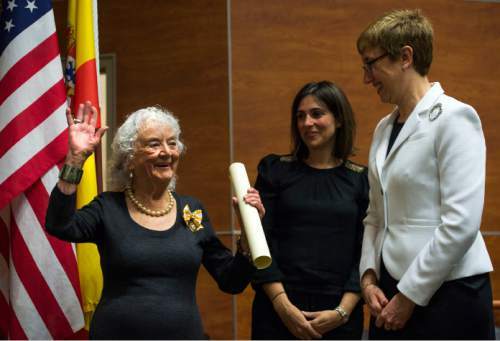 Dignitaries from Salt Lake City to Spain celebrated Utah artist and sculptor Pilar Pobil on Friday as she was awarded the Cruz de Oficial de la Real Orden de Isabel la Catolica in a ceremony at the University of Utah Tanner Humanities Center. 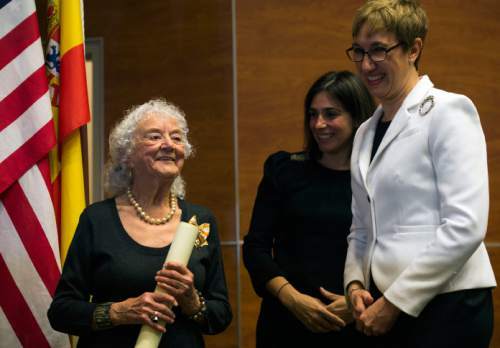 The award, presented by the Ministry of Foreign Affairs of Spain, was started by Queen Isabel in the 1700s to honor those born in Spain who have expanded the arts and culture of the country, although they may live elsewhere. Pobil, born in Madrid in 1929, is best known for her brilliantly colored watercolors and oils that have been exhibited throughout Utah and in Spain and Mexico.